Buying watercolor brushes. How to buy watercolour brushes. If you are thinking of buying some new watercolor brushes what should you be looking for and how much should you spend? In the past the answer to this question would have been quite simple, “The most expensive brushes you could afford”, usually this meant one made with sable hair. This is quite a simplistic piece of advice but it was something I read over and over again in watercolor painting books and magazines. However I don’t believe this is really the correct advice, certainly not any more. Well let’s look at what makes a good round watercolor brush. • It has to hold a lot of water and watercolor paint. • The wet round brush should bounce back to a nice point when it is tapped on the side of your water container or your pallet. • It should not be so stiff that it will easily disturb paint already on your paper when you are laying a watercolor glaze over it. Remember watercolors are quite delicate and their pigments are easily disturbed when re-wet. • It should feel good in your hand for your style of painting. All of these things are very easy to check when you go to your local watercolor art supply store. Any reputable art supplier will supply you with a glass of water for you to be able to test their brushes before you purchase. If they won’t do this explain to them your reasons and if they don’t want to assist you then go to another store as the last thing you want to have happen is to buy an expensive brush that looks good but as soon as you test it out in water you discover it has no point, holds little water and is either too stiff or does not bounce back to a point. Watercolor brushes often look great on store shelves with really nice looking points, but this is because they have a type of water dissolvable glue on them that keeps then that way. When you test them out by swirling them in water this glue comes off and you can really see what sort of point the brush has! Remember even reputable suppliers sometimes will have a brush with a fault (but they should be very willing to replace it if they do). I have found some very good brushes made with squirrel hair which fulfill the requirement above for about a tenth of the cost of very good sable brushes. So why spend the money if you don’t have to. And while of the subject of sable brushes, while there are some very excellent brushes out on the market by reputable art equipment manufacturers there are also some quite poor brushes which are not really worth the money you pay for them. What I mean by this is that it is better to have a good non-sable brush and a low quality watercolor brush made with sable. Obviously you should hold the brush as you would when you are working with it on your watercolor paintings and if it does not feel right then doing buy it as you want the brush to feel good in your hands. Some brushes have handles that are too short or too thick – we are all different and you need to find one that feels good to you. After all with good care you will have your brushes for many years. I haven’t talked about the actual quality of manufacturing here. Obviously if you try to spend too little on a brush you may end up with serious quality problems. A friend of mine bought a large round watercolor brush from a discount store and only paid about $15 dollars for it. He thought he had bought a great deal however right from the start it started shedding hairs, not just one or two as sometimes happens with a new brush for a very short while, but about a dozen with every painting. So now not only did he feel bad about the poor brush he bought but the ruined paintings were even more painful. This happened when he was starting out with watercolors and it was certainly a hindrance to his progress. Don’t think that just because you are a beginner that it is alright for you to have poor quality brushes – that is a bit like saying it is okay to learn to right a bicycle with a wobbly wheel because you are a beginner. No, watercolor is hard enough when you start off that you should have the best equipment you can afford so that you are not held back by poor materials. At the same time you don’t have to spend hundreds of dollars on a brush when forty dollars is more than enough. I tried many different brands of watercolor painting brushes before I found one that was best for me and then I have stuck with it. 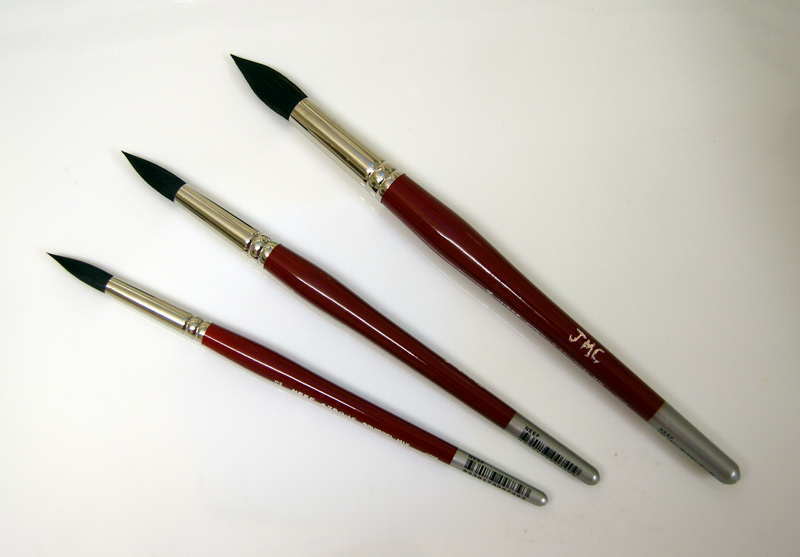 When buying watercolor brushes it is important to get the right brush not necessarily the most expensive.